The Ritz-Carlton, Kapalua is a luxury resort that offers attentive service and a diverse choice of activities. Located on 50 acres of Maui's northwest shore, the hotel is surrounded by 36 holes of championship golf, beautiful beaches, and features a Hawaiian spa. For families, The Ritz Kids provides full-day and half-day recreational and educational programs. Families can explore three beautiful beaches at Kapalua and many others on the island of Maui. The plantation-style hotel has 548 rooms and suites, many with ocean views. Public spaces and guest rooms are decorated with original paintings and ceramics by local artists, as well as traditional 18th and 19th century artwork. Check for packages which are often offered at the hotel. Guest rooms, which measure 450 square feet in size, have private balconies and marble bathrooms with a separate shower and bathtub. The suites range from 870 to 1,400 square feet. For added comfort, the 32 Club Level rooms and four Club Suites offer privacy, a dedicated concierge, and five complimentary food and beverage presentations daily. The property is home to two great golf courses and the Kapalua Golf Academy. The golf courses are surrounded by a pineapple plantation and have spectacular views of the Pacific. The Bay Course was designed by Arnold Palmer in the 70s, while the Plantation Course was designed by Ben Crenshaw and Bill Coore in 1991. The Plantation is home to Mercedes Championships, held at Kapalua each January. To help you get in shape, the Fitness Center offers a Fit for Golf class which targets specific muscle groups, such as the lower back, abs, wrists, elbows and knees. Waihua Spa offers therapies inspired by Ancient Hawaiians that rejuvenate and invigorate the body and the spirit. Plants and flowers grown in Waihua's own medicinal herb garden are incorporated in a line of body and face treatments, massage therapy, and wellness packages. The spa features its own line of aromatherapy oils produced from locally grown flowers. The spa's signature treatment, A Hawaiian Healing Experience, begins with a selection of one of the seven essential oil blends. These oils were designed to create harmony, empowerment, stress relief, protection, spiritual awakenings, family relations or self-esteem. A Hawaiian Healing Experience treatment features a Hawaiian chant playing softly in the background, while pouches containing warm stones are placed on the body. The guest is then massages with the selected oil blend. In addition to signature treatments, the health spa offers a range of face and body treatments, massages, wraps, fitness and wellness services. To make an appointment, call The Fitness Center & Spa at 808-669-6200. In addition to playing scenic golf, you can enjoy 10 tennis courts, a 10,000-square-foot cascading swimming pool, two outdoor whirlpool spas, a nine-hole putting green, croquet lawn, and a 7,000-square-foot fitness center, steam and sauna rooms. Guests at The Ritz-Carlton, Kapalua have the opportunity to get to know Hawaiian customs through the hotel's Hawaiian Cultural Advisor. Guests can visit the Honokahua Preservation Site at the resort, join a lei-making class, and watch wood-carving demonstrations. The five restaurants at the hotel serve diverse dishes, ranging from eclectic Pacific cuisine to sushi and sashimi. Breakfast is served at The Terrace restaurant overlooking landscaped gardens and the Pacific Ocean. The Banyan Tree restaurant has panoramic views of the island of Molokai and the Pailolo Channel. Alternatively, you can dine in the shade of coconut palms at The Beach House Bar and Grill. The Lobby Lounge and Library serves tropical cocktails such as the signature Kapalua martini made with fresh Maui pineapple. The Ritz-Carlton, Kapalua is a playground for grown-ups and kids alike. 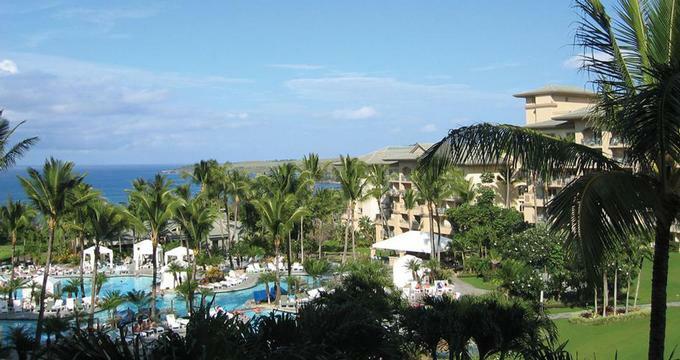 The hotel is part of the Kapalua Resort which offers a spectrum of family vacation activities, including several beaches, two golf courses and three programs for kids. The Ritz Kids full-day and half-day recreation and education programs are designed for children ages five through twelve. Kids explore Hawaii's natural wonders, swim in the three-tiered pool and visit a beach. They also play on the nine-hole putting green and bocce ball lawn, participate in games, and listen to story-telling in the private Ritz Kids Room. The Ritz Kids is offered daily. Full-day programs cost $65 per child, including lunch, while half-day morning or afternoon programs cost $35 for hotel guests. Once a week, the Kids Night Out is offered from 5 to 9 p.m. for $45 per child for hotel guests. Additional siblings receive a 20% discount. For reservations, call 808-669-6200. Kids ages 11 to 16 can participate in the Adventure 7 program, choosing from activities such as a beach adventure at Kapalua Bay and arts & crafts. The Adventure 7 program is held weekly from 8:00am - 3:00pm and the cost is $60 per day. For more information contact The Art School at Kapalua at 808-665-0007, www.kapaluaart.com. In season, children ages 5 through 16 can participate in the complimentary Kapalua Keiki Club, which includes tennis clinics, golf and snorkeling. This free program is fun and can save you money on your family vacation. Rates range from $599 per night plus tax for a Garden View room to $8,000 per night for a two-bedroom Royal Pacifc Suite. Seasonal specials, golf and other Hawaii packages may be available on the hotel's web site. The closest airport is Kapalua airport located five minutes from the resort. Maui's other airport, Kahului, is a 50-minute drive.